Marlie and Me: We Conquered Khan at the Irving Arts Center! 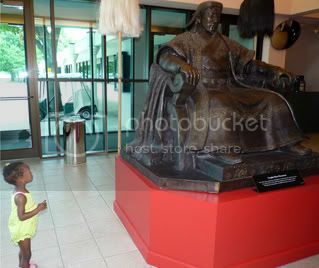 A couple of weekends ago we met up with another family at the Irving Arts Center to see the Genghis Khan exhibit with two toddlers in tow. Every inch of the exhibit was spectacular and the girls loved every minute of it! We attended the free Family Khan Day on July 9 where we made our own ancient Mongolian travel passports. Marlie and Orlaith love to paint so this art project was right up their alley! There are three more Family Khan Days scheduled for August 13, September 10 and September 24...mark your calendars. While our passports were drying we entered the land of Genghis Khan. It is recommend that you bring a sweater or jacket for each member of your party because the exhibit hall is kept at a low temperature to protect the mummy. If I was a teacher or homeschool parent, I would be tickled happy by the learning opportunities offered by the Genghis Khan exhibit. There are many classroom activities designed around the exhibit like word find puzzles and scavenger hunts. The possibilities are endless! Kids of all ages will enjoy Genghis Khan. Marlie was really taken by the the life-size replicas of a shaman, nomadic dwelling, and mounted horseman. I was really surprised that she wasn't afraid of the menacing looking warrior. She even took a peek at the mummy. I think her favorite part was touching the military helmet, chain mail, and arrowheads at the volunteer-led interactive kiosk. At the end of the exhibit we were treated to a live musical performance by Mongolian artists. 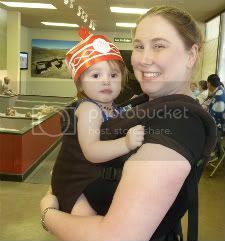 Orlaith loved the paper Mongolian hat she received as a parting gift! The entire exhibit was fascinating from beginning to end, but don't take my word for it, go see for yourself. The Genghis Khan exhibit closes on September 30, don't miss it! Disclosure: I am participating in a promotional campaign on behalf of Irving Arts Center as part of Business2Blogger. All opinions expressed are my own. How cool! I know my girls would love that. I think it's great that you take Marlie to places like this. So many parents think little ones are too young for stuff like that, but that's not true. We had so much fun with you guys! Orlaith loved the exhibit and all of the activities! They made it so well-rounded, and involved so many senses for kids to experience it with. Fabulous! That is really cool! I had no idea that Genghis Khan had a mummy! 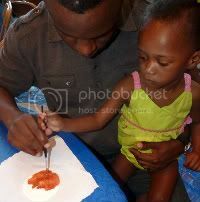 My kids would have loved that experience! Me too! I'm glad that you all had fun :) Thanks for the beautiful comment on my post about my dad. You're a great buddy to me here :) Hugs back to you Teresha! Oh how I would love something like this around here. It's not like we live in a tiny city. Love the picture of Damon and Marlie.